Smells very lovely and I have gotten compliments but it has poor staying power. Personally I disagree with the lady that says it doesn't last long. 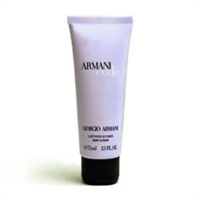 I have had quite the opposite experience happening to me by comments made people have made a comments about Armani Code late in the afternoon, hours after I had put it on. One lady followed me through the grocery store inquirng what was I wearing that smelled so good. Or, I would be in a room full of ladies and one person would ask who it was that smelled so nice, It's my favorite cologne. preciso de informações em portugues. como pago o frete e quantidade minima. The smell is pretty nice but it does not last very long. It would be good for people looking for a more subtle scent that don't like strong perfume. I usually like my perfumes to make a statement and this one is too weak for my taste.